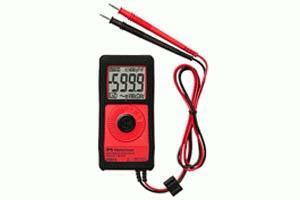 The PM55 is the most full featured multimeter in this minute size. Includes VolTect and AutoTect. It measures AC and DC voltage to 600 V, AC and DC current to 2000 µA, resistance to 6 M?, capacitance to 2000 µF, and frequency to 30 kHz.ÜSafety rated to CAT III 300V, CAT II 600V, cULus listed.